Accurately detect exit points before drilling and coring with the Zircon® ExitPoint® XL300 through-hole drill guide. 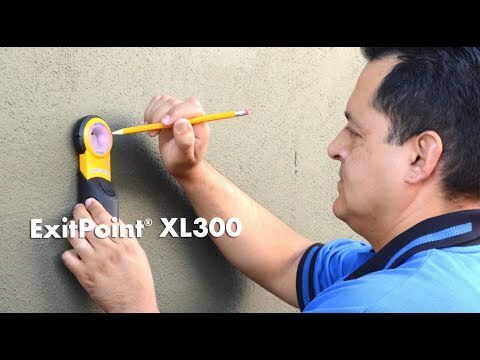 The XL300 is the easiest and fastest way to locate a precise spot, without measuring, before you start your project. Scans through most types of non-magnetic building materials, such as wood, drywall, gypsum panels, bricks, and poured concrete up, to 11.81 in. (30 cm) thick. This simple, yet effective, tool saves time and money by reducing guesswork, rework, and unnecessary holes. Ideal for cable and wire installations, concrete scanning, and anytime through-hole drilling is required. Affix the transmitter magnet on the spot to be drilled, then scan the vicinity of the other side of the wall with the receiver. When the receiver is near the center of the transmitter, and the field strength is strong, the receiver will light red. Includes receiver, small and large transmitter magnets (2), reusable adhesive discs (9), AAA batteries (3), Quick Reference Guide, and protective carrying case. Note: Tool does not detect hidden objects behind the wall. Must use other information sources to locate, and avoid, objects behind surface before drilling.